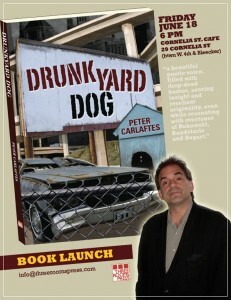 Power poet Peter Carlaftes will launch his first full-length poetry collection, DrunkYard Dog (156 pages, Three Rooms Press, 2010) at the venerable Son of a Pony Poetry Reading Series on Friday, June 18, 6 p.m. at Cornelia St. Cafe. Carlaftes work has been described as “a beautiful poetic voice, filled with drop-dead humor, searing insight and reselient originality, even while resonating with overtones of Bukowski, Baudelarie and Bogart.” He discovered his poetic voice on the playgrounds of the Bronx, and, after seeing the world, branched out to the bars of Manhattan. According to Carlaftes, DrunkYard Dog offers poems from “both sides of the bar,” and marks his third Three Rooms Press release in 2010, following A Year on Facebook (humor) and Triumph for Rent (three plays). The featured reading follows the fabulous Son of a Pony open reading at the cafe. Poet/convivial mistress of ceremonies Kat Georges hosts. Doors open at 5:45 p.m.; the open reading begins at 6 p.m. Admission is $7, which includes a free drink.